Bodycare is usually the beauty bit I find a little snoozey, but at this time of year my interest piques. Impending summer holibops, the odd spot of legs-out weather here at home and regular dips into chlorinated water has necessitated a little extra care. Fortuitously, Mixa has arrived on Irish shores to smooth my rough and flaky bits. This (mainly) bodycare brand, created by a French pharmacist in 1924 for dry and sensitive skin, has just launched into Irish (and UK) pharmacies. It’s a frills free, high performing brand that’s easy on the pocket, too. There’s loads to choose from in the range: they sent me a big bundle to try out, and these are the three that have made it into my regular routine. My pick of the bunch is the multi-tasking Cica Repair balm which is intended for use by all the family. La Roche Posay have a very similar product that I also rate – both are thick, soothing Vitamin B5 creams which moisturises and repairs all manner of skin irritations. You can use Cica Repair balm on the face, body and hands: it sorts everything from chapped lips to eczema and is a great little all-rounder to have on hand for a not-very-big €6.50. I’m also enjoying the Restoring body lotion – one of five in the range, which are €7.25 for 250 ml here. The packaging is grand: more functional than anything else, which is what you’d expect from an affordable, results-driven pharma brand. I really like this; it’s super hydrating and absorbs quickly, so it’s nice to use after my morning swim. 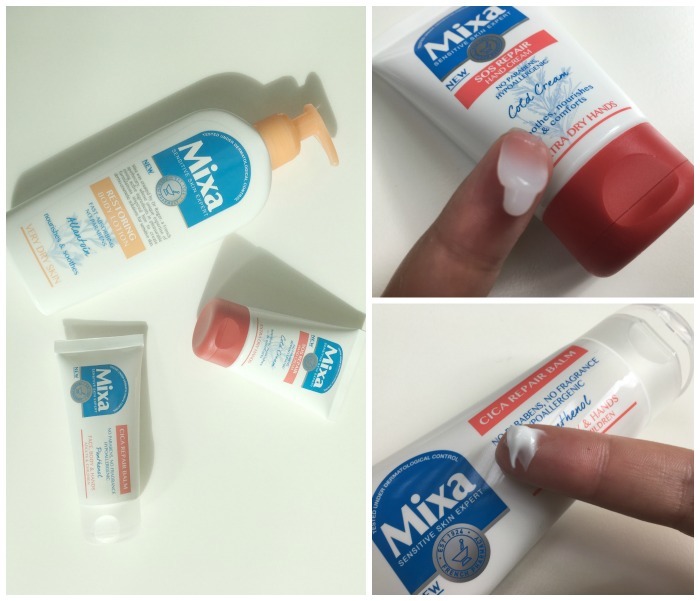 And this is impressive: Mixa has been the #1 body lotion in the French market for the past decade, and we all know those French women know their shizz. Of the three hand creams on offer, it’s the SOS repair hand cream (€6.50) which has most tickled my fancy. Described as a cold cream, this is a really rich, unctuous balm that’s nicely handbag sized and works serious wonders on my dried out paws. Have you spotted Mixa on shelves yet – or tried anything from the range?